Catsparella is Stephanie Harwin. I enjoy cats, cupcakes, and cupcakes that look like cats, and count meeting Hello Kitty in Japan as one of the happiest days of my life! A New Jersey native, in December 2013 I moved to St. Louis, MO where I now work at Nestlé Purina as the Community Manager for Pro Plan Cat! 10+ years ago I made up the word "Catsparella" as an email address. I was trying to think of something "cool" and "glamorous" that 1. involved cats, and 2. (more importantly) wasn't already taken. The name was inspired by Cinderella, Barbarella, and Catwoman and Vampirella, which I happened to be reading at the time. Years later, when I decided to start a cat blog, the name seemed like a perfect fit. Now, Catsparella is an award-winning cat culture blog, dedicated to my passion for finding and sharing all of the coolest cat related content online. Beyond pictures, news, and videos, I go deeper into kitty culture, tracking trends, and highlighting everything from cat art and fashion, to cupcakes and celebrity cat gossip. I get exclusive interviews, feature unique products, and dig up all of the latest cat dirt you won't find anywhere else! Within the first year of launching Catsparella in August 2010, I was named as a finalist in the search for the first ever Purina Cat Chow Correspondent, invited to be a Guest Blogger on the set of the Fancy Feast "Something Borrowed" Storybook Wedding commercial shoot, and honored by Dogtime Media with a coveted 2011 Petties Pet Blogging award in the category of Best Social Integration Blog. Catsparella has appeared on sites such as PawNation, Jezebel, BuzzFeed, and I Can Has Cheezburger, and has garnered mentions in The Washington Post, LA Weekly, Travel + Leisure, Modern Cat Magazine, and Family Circle. 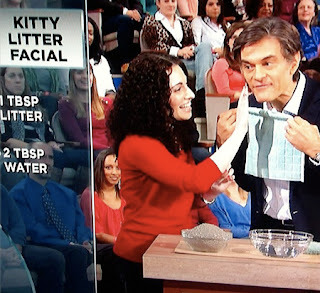 I have worked on projects for Purina Fancy Feast, Pets Add Life, and Apartment Guide, and was featured on "The Dr. Oz Show," where I did a segment on kitty litter facials. I am a professional member of the Cat Writers' Association, and was a contributing writer for Catster, where I penned a weekly style column for cat lovers. Interview with Catsparella's Stephanie Harwin - Mousebreath! Meet the Purina Cat Chow Finalists: Charlie and Priscilla's Mom - Mousebreath! Want to know more? Drop me a line at catsparella@gmail.com.